This is my sewing kit. It’s a box of dental floss with a couple of needles, with eyes big enough to accommodate the floss, in it. It works so well, it is all I ever use to sew things. Total weight: .50 ounce (15 grams). The needles are also handy for popping blisters and digging out splinters. 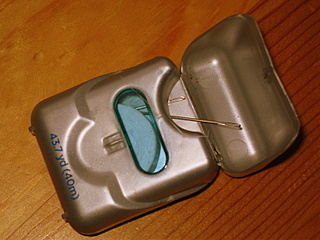 The dental floss of course is also good for flossing your teeth. Previous Previous post: Warming up. Next Next post: Menstrual care on the trail and off.